Disclosure: I received this set free of charge to be reviewed. All my opinions are 100% honest. The brand Poetic Works Lingerie was founded by designer Amarantha Harrison and creates sustainable lingerie that’s handmade in the USA. The size range spans from 32A to 36D for the bras and from XS to XXL for the briefs – a sizing guide with hip measurements is included on the Poetic Works Lingerie website. If you are not within that size range or wish for a unique design, it’s possible to contact Amarantha Harrison for custom orders. Similar designs to the Tennyson Grey set are available in different colourways, such as red and black (Noyes range), navy and ivory (Una range), and burgundy and ivory (Edgar Allen range). 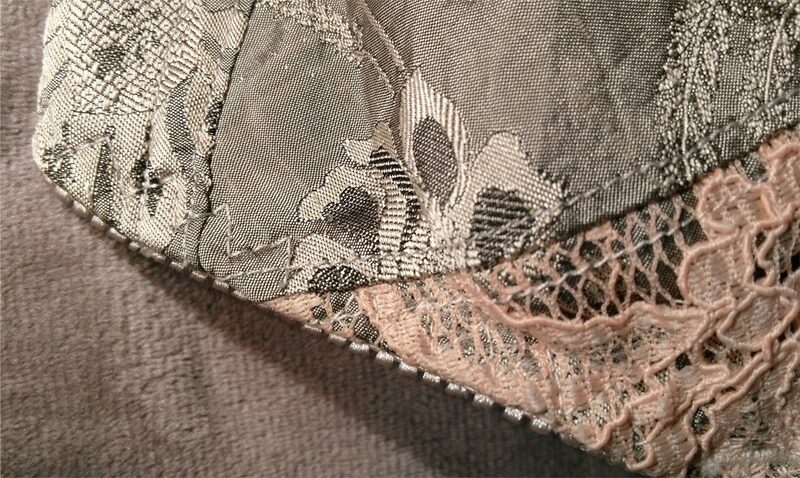 I asked for the Tennyson Grey set as I liked the combination of the greyish/greenish jacquard silk with the apricot lace very much. While black lingerie is usually my go-to for the most part, I do have a soft spot for romantic and feminine colours as well, and I considered this elegant design to be a great addition to my drawer. The bra straps are made from light beige elastics. The front of the brief plus the back of the brief and the bra consist of pure white cotton, which in my opinion is a rather harsh contrast regarding the other colours used in the range – I would prefer beige or apricot cotton panels on this set, to ‘soften’ the overall look. The insides of the bra cups are lined with apricot silk. When I received the set, I noticed that the small peach lace stripes on the front of the brief are not the same lace used on the bra cups, however it still looks great and I think the set is very beautiful! Even though I do not sew myself, I am very impressed with the stitching and construction; everything is sewn very neatly. I can’t detect any loose threads or stitching mistakes, and while wearing this set, I could not feel any irritation whatsoever. The crotch lining is made from cotton, while the insides of the bra cups are lined in silk, which makes wearing the set very comfortable! Even though the bra is unlined, it creates a nice round shape on me, so I could absolutely wear it under a t-shirt if I wanted to. I chose the bra is size 32B and the brief in size S after looking at Poetic Works Lingerie’s size guide on the website. The fit of the bra is spot on, so there is no bulging or gaping whatsoever. The brief fits well for the most part, however, the leg openings feel rather tight. If the leg holes had been slightly bigger, or with a slightly less strong elastic used on the inside, it would be more comfortable for me to wear. Overall, if I were to order again, I would probably go for size M in the brief (I wear size UK 8-10 on the regular). I have been strictly hand-washing this set as recommended on the label, and so far, it seems as good as new. 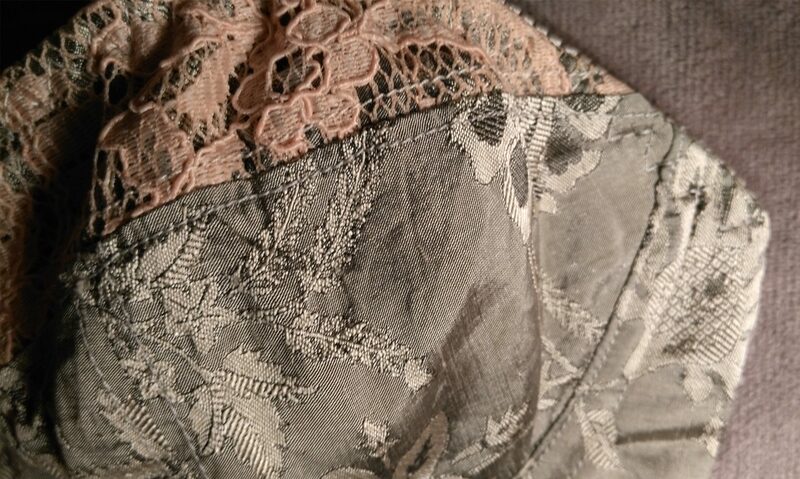 As I already mentioned, the general construction as well as the jacquard silk feel very sturdy and the lace is in great condition, too, so I am confident it will stand the test of time. Something I love about this set is that it is possible to wear it as an everyday set – it is comfortable, durable and looks great under clothes! The Poetic Works Lingerie Tennyson Grey set costs $160 (~£113 / ~129€) for the bra and $60 (~£42 / ~48€) for the brief, so it clearly is an investment. Since the pieces are handmade by one person only though, and the organic cotton is made in the USA, I think that the price is absolutely justified. Not to mention that the pieces are beautiful, well made and very comfortable. While not all designs by Poetic Works Lingerie speak to me, I am very, very happy with the set I own. I have been wearing the pieces more often than I initially thought I would as they feel and look so beautiful. It really exceeded my expectations. How do you like Poetic Works Lingerie’s designs? 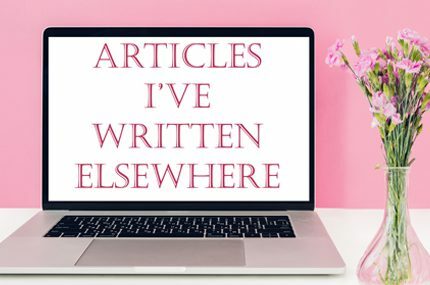 Have you bought something from Poetic Works Lingerie before?